A shark's teeth are generally triangular, arranged in several rows and are used for tearing not for biting. When the front row is worn down, the teeth are designed to bend forward and drop out. Their place is taken by the next row of unworn teeth. The worn state of many shark tooth fossils tells us they had dropped out while the shark was still alive, fell to the sea floor where their natural rock hard bony material covered with enamel was easily preserved. Shark fossils were right in there at the start of Paleontology via the research of the Danish physician and naturalist Nils Stensen. He was a 28 year old Protestant anatomist in Copenhagen when he was invited to Florence by Arch Duke Ferdinand II de Medici. Ferdinand II was the protector of Galileo, and now became Stensen�s promoter. The Arch Duke�s made Stensen his personal physician and tutor to his children. Under Medici�s patronage, Stensen converted to Catholicism and took the Latin name Nicholas Steno. In Steno's day, fossils were regarded as strange tricks of the gods. Only eccentrics regarded them as the actual remains of creatures and this was frowned upon by church authorities, who strangely had accepted the ancient Greek Pagan philosophers writings as unquestionable. Some prominent naturalists had already voiced the suspicion that fossils known as tongue stones (glossopetrae) were shark's teeth. In 1667, Steno was able to study the teeth of a shark stranded near Florence, which convinced him �tongue stones� were indeed fossil sharks' teeth. But what kind of sharks? More importantly, how did their teeth become imbedded in rocks? Since the fossil teeth in his possession were slightly different from the teeth of modern sharks, Steno suspected they came from a variety of extinct sharks. Steno wrote the founding book of Paleontology, with the very lengthy title of 'Introduction to a Dissertation on the Solid Substances actually Contained within Solids�. Steno pointed out that it is logical to believe that the top layers of rock must have been deposited after rock layers below. This is now known as the Principle of Superposition. Steno also pointed out that fossils in different layers could vary greatly. He planned to complete his work on fossils, but entered church ministry instead and served as Bishop of Munster in Westphalia (now Germany). He lived out the last years of his life in abject poverty and died in 1686, a forgotten voice until a century and a half later, when the creationist, Humboldt, rediscovered and promoted Steno�s work. The teeth of the so called first fossil sharks - like Cladodus, from mid Devonian rocks - are surprisingly similar to modern sharks (Devonian rocks take their name from Devonshire, England.) Because of the sudden appearance of sharks in the fossil record, evolutionists have had real problems explaining their origin. Many have suggested that instead of being creatures which evolved a non-bony (cartilage) skeleton, they must originally have had bony skeletons and later lost the ability to produce calcium deposits, so their skeleton degenerated to cartilage only. Despite the absence of a hard skeleton, a surprising number of whole shark fossils have been found with fully preserved internal organs, such as kidneys, liver, heart, stomach, brain casing and intestines. Specimens are known from the USA (Cleveland shale in Brooklyn Heights, Ohio, Sarpy County, Nebraska, Cass County, Nebraska, Mason Creek area, Illinois, Logan Quarry Shale, Indiana, and Powell County, Kentucky), and from Holzmanden Germany, and Solnhofen Bavaria. Most of these complete shark fossils are found in shale supposedly deposited slowly in still water, but the evidence from the enclosed whole sharks indicates the shale was rapidly deposited. In Australia, fossil shark material is found in Central Queensland and Victoria (around Melbourne), and in South Australia (slightly east of Adelaide). In Western Australia there is an outcrop at Gin Gin, north of Perth. 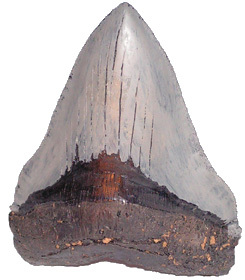 Shark fossils (teeth and bodies) are found worldwide. From the first to the last, the one thing you can be dogmatic about is that sharks have produced sharks, just as Genesis says God created them to do. SPECIOUS PROBLEM Minor differences in teeth compared to the present white shark have led people to put the fossil giant in its own genus of Carcharocles. The teeth differences however, may only be superficial as it has been noted that in the present day great white sharks, the older the shark gets and the bigger its teeth get, the more they resemble the teeth of C. megaladon. Since sharks continue to grow throughout their lives, Carcharocles megaladon may simply be a very old Carcharadon, which is in fitting with the Biblical account of lifes history which lists a progressive decrease in life spans from creation to the present. A few extra large teeth suggest this shark may have weighed up to 65 tonnes and reached a length of 20 metres or 60ft. Since no whole fossils known, size estimates are based on comparative studies of teeth size to weight and length of present day great white sharks.